This book stretched my mind more than almost any other book I’ve read. It’s tough at parts, it’s long, but you’ll come out of it thinking about brains, minds, intelligence, and AI in an entirely new way. The Offering has a three part fugue, a six part fugue, ten canons, and a trio sonata. Canons: In a canon, a single theme is played against itself. Like Row Row Row Your Boat. In the basic canon, the first voice enters, and after a period, the second voice enters at the same beginning as the first, layering on top of each other. There are also more complicated canons, where the second voice may enter at a different pitch as well. Fugue: A fugue is like a canon, in that it’s based on one theme which gets played in different voices, but the notation is much less rigid and you can play with it more. Bach created an “endlessly rising canon,” in which it ends and immediately restarts but a note up. The transition is seamless, and allows it to continue rising forever. This is the first example in the book of a “Strange Loop,” a loop whereby moving through it we unexpectedly find ourselves right back where we started. Such as in the famous Escher paintings like the infinite staircase. The real conclusion is that the system is incomplete, there are true statements which its methods of proof are too weak to demonstrate. To get rid of strange loops, you have to get rid of self reference. But a complete system requires self reference, thus, strange loops. Requirement of Formality: You must not do anything outside the rules of the system. In formal systems, theorems are merely produced according to certain rules of the system. These are called the “rules of production.” A “free” theorem that we know to be true is an “axiom” of the system. A “derivation” is an explicit, line by line explanation of how to arrive at a theorem according to the formal rules of the system. One big difference between machines and humans is that it is possible to program a machine to do a routine task, while noticing no higher order to what it’s doing. Humans will always recognize these patterns when they’re sufficiently obvious. A car will never pick up the idea that it is supposed to avoid other cars. It is necessary to distinguish between operating within the system and making observations or statements about the system. This is the M-Mode (mechanical mode) and the I-Mode (intelligent mode). Philosophical Problem: do words and language follow formal rules, or do they not? Isomorphism: An information-preserving transformation. It applies when two complex structures can be mapped onto each other, in such a way that to each part of one structure there is a corresponding part in the other corresponding structure, where the two parts play similar roles in their respective structures. The perception of an isomorphism between two known structures is an advance in knowledge, and the source of creating meanings in people’s minds. Artists distinguish between “figure and ground.” Usually the figure is the focus, but sometimes there will be more meaning hidden in the background. In this dialogue, they’re discussing the Tortoise’s record that broke Crab’s record player by playing a sound that disassembled it. The clever element here is how there is meaning “above” the discussions. The first letters of the different lines in the dialogue spell out a sentence that is itself self-referential. There is more to meaning than what’s obvious. People attribute inherent meaning to words, when their context is just as important. Or you might attribute “sound” as a necessary element of a collision between two objects, but there would be no sound if they collided in a vacuum. The noise requires a certain medium. In the dialogue, the Tortoise is saying that there can be no sufficiently strong record player to withstand any record’s ability to vibrate at the rate that will destroy it. Consistency: When every theorem, upon interpretation, comes out true (in some imaginable world). Completeness: When all statements which are true (in some imaginable world), and which can be expressed as well-formed strings of the system, are theorems. In this dialogue, Tortoise and Achilles end up being abducted into a hot air balloon off of the ferris wheel. They arrive at their captor’s “lair” and end up going into a book he has about Achilles and the Tortoise, in which they find an Escher painting. They then go in a step further to the alligator painting. Then there’s a genie who can grant wishes, but has to ask “up the chain” if he can grant a meta wish. Then they go down one more story into the labyrinth. Eventually they pop back up a number of levels, but they still haven’t “exited” the house of their captor, despite the story ending. To push means to suspend operation on what you’re currently doing and take on a new task. This new task is said to be “on a lower level” than the previous task. To “pop” is to jump back out to the previous task you were doing. In a recursive definition there’s always a “bottom,” a way out. But in circular definitions it continues forever. You can think of a record as an information bearer and the record player as an information revealer. Alternatively, a molecule of DNA is a set of information (genotype) which is converted into a physical organism (phenotype). Can a text have enough inner logic that its meaning is fully restored whenever intelligence comes into contact with it? Or must there always be some element of the information revealer bestowing meaning to it? We can say that meaning is part of an object to the extent that it acts upon intelligence in a predictable way. Three Layers to Every Message: We can say that a message has three layers: the frame, the inner message, and the outer message. Consider a bottle on a beach: the frame is found when you pick up the bottle and see it contains a message. Then when you open it and see that there is language on it, you’ve found the outer message, the need to decode it (you may also need to figure out what language to decode by recognizing the language), and then you can figure out the inner message, what it meant to say. There’s a potential infinite trap: believing that you need a greater message to understand the included message, like needing a rule to understand the rule. In this canon, Achilles and the Tortoise are having a conversation in which they’re interrupted by Crab, after which they repeat their statements in reverse order switching rules (basically, a conversational palindrome). This expands on the TNT explanations, bringing in more elements of logic and mathematics. “Any system that is strong enough to prove TNT’s consistency is at least as strong as TNT itself.” So circularity is inevitable. This is the discussion of Koans and zen strings. Discusses how koans can let the practitioner “step out” of normal logical reality. The monk Mumon collected 48 koans with poems and short commentaries that accompanied them. A concise explanation of enlightenment: transcending dualism. As soon as you perceive an object, you draw a line between it and the rest of the world. You divide the world, artificially, into parts and thereby miss the Way. Zen strives for Ism, an anti-philosophy, a way of being without thinking. It is the fate of us as higher beings to have to strive for ism without ever being able to attain it fully. Escher’s paintings in making us ask “are those birds? or planes? or frogs?” make us step out a bit towards ism, recognizing the inherent absurdity that they’re not anything at all. There is no such thing as an uncoded message, only a message written in a more familiar code. This is a self-referential dialogue where they’ve constructed a lost Bach piece from thin air, deriving it using mathematics. It’s talking about how there are different “modes” we can consider something (such as an Escher painting, a fugue, or the dialogue itself). Intelligence depends on the ability to create high-level descriptions of complex arrays, such as chess boards, printed pages, or paintings. You can “bootstrap” a language by acquiring enough of it to keep teaching yourself more of it. That’s a certain inflection point beyond which you no longer need to “step out” of the language to keep growing in the language. You don’t have to know everything about quarks to understand the molecules that they compose. There are certain epiphenomena, consequences of the system that are not contained in the system. Nowhere in your body is the number “9.3” coded if you can run 100 yards in 9.3 seconds. Similarly in the game Go, the “two eye” rule isn’t coded in the rules anywhere, it’s a consequence of the other rules. Perhaps the mind can be understood without understanding the lower levels on which it both depends and does not depend. Is consciousness an epiphenomenon? Or do you have to go down to the level of the nerve cell to understand the mind? The anteater is on good terms with the ant colonies, just not specific ants, since he eats ants, but doing so helps the colonies. Aunt Hillary is made up of ants, the individual ants don’t have thoughts or intelligence but they combine to an intelligent system. Just as every individual neuron need not be intelligent to create an intelligent being. You might think of your brain as an ant colony. There are emergent pieces of a system. You don’t read every individual letter and then put them together into words, you can read whole words at once, despite the composite letters having no inherent meaning. There is a “calculus of thinking” where concepts can suddenly merge and split, such as when you find out that the person next to you in the bathroom is also your friend from the gym. It is said to be intensional instead of extensional, which means the descriptions can float without being anchored to specific objects. The intensionality of thought gives it its flexibility, it lets us imagine new worlds and combine and chop up descriptions. A single neuron can only respond by firing or not firing. Symbols comprise larger groups of neurons firing in certain ways, it’s a level above. There are two challenges: one is to explain how the low-level traffic of neuron firings gives rise to the high-level traffic of symbol activation. The other is to explain the high-level traffic of symbol activation in its own terms, to make a theory which does not talk about the low-level neural events. If the latter is possible, then intelligence can be realized on non-brain hardware. If you imagine a car skidding on a mountain rode, you’ll imagine the mountain as bigger than the car, but you’ve never explicitly laid out that comparison, most likely. Rather, it happens naturally from your stored symbols of cars and mountains, without being explicitly declared. Knowledge is not stored explicitly, but implicitly, in a spread out manner, rather than as a local packet of information. Simple facts such as relative sizes of objects have to be assembled rather than merely retrieved. This dialogue contains the poem “Jabberwocky” in three different languages, notable since the poem is mostly gibberish and so that gibberish can’t translate all that well. Surely there won’t be isomorphisms on the neural level, but could there be on the symbol level? Could we map part of one mind onto another one? Clearly not entirely, since if it did, there would be two humans with identical thoughts. Even within yourself your brain changes, imagine looking at something you wrote even a few months ago. The symbols among people with the same native language will likely be similar, but how does that change in new languages? We’re all bundles of contradictions, and that’s a natural function of our brain, being able to hold contradictions comfortably. Here they introduce the diagonals, first talk about DH himself, and make allusions to ending the discussion earlier than the written discussion ends. If you have a sufficiently powerful formalization of number theory, then Godel’s method is applicable, and your system is incomplete. But if your system is not sufficiently powerful, then your system is by virtue incomplete. Not going to lie, I got a little lost in this section and I didn’t feel like it ended up being necessary to understand the higher level takeaways of the book. This dialogue is the “yields falsehoods” one, in which they discuss self-referential statements that are self destructive (Epimenides Paradox). “Is a sentence fragment” is a sentence fragment. Once again, very heavy in math and logic and I didn’t end up needing the core points that much I felt. Or maybe I just didn’t focus on them deeply enough. The Tortoise insists on Achilles proving with increasing certainty that it’s his birthday, “how can I trust that I can trust you?” and so on. 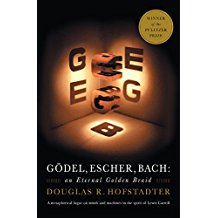 Some argue that Godel’s theorem proves that mechanism is false, that minds cannot be explained as machines. A program cannot jump out of itself. No matter how much it twists and turns, it is still following the rules inherent in itself. Including us. There’s a difference between “seeing” ourselves and “transcending” ourselves. But you cannot quite break out of yourself and be outside of yourself. In zen we can see this idea of self transcendence. The koan helps you “step out” and break the rules of thought you’re normally constrained by. This is the dialogue with the surreal paintings that the Crab keeps interacting with while talking to Achilles. Self-Rep: Self reproducing object or entity. Self-Ref: Self referential object or entity. A protein is manufactured by a ribosome according to the blueprint carried from DNA to RNA. But the ribosome doesn’t know the genetic code, it’s contained in the DNA. DNA sends off long strings of messenger RNA to the ribosomes in the cytoplasm, and the ribosomes make use of the “flashcards” of tRNA hanging out to construct proteins, amino acid by amino acid. Incompleteness Theorem and DNA: It is always possible to design a strand of DNA which, if injected into a cell, would, upon being transcribed, cause such proteins to be manufactured as would destroy the cell (or the DNA), and thus result in the non-reproduction of that DNA. This is the dialogue where the crab can play mathematical statements as music, but they only sound good if they’re true. One of the main theses of the book: every aspect of thinking can be viewed as a high-level description of a system which, on a low level, is governed by simple, even formal, rules. You could say that the brain exhibits no more amazing of a “process” than the stomach. There’s no magical higher level, it’s simply following the programmed rules. In this dialogue the character Eta Oin is telling the SHRDLU program to manipulate blocks within a computer simulation. The Turing Test imagines a computer and a person in another room, with you asking them questions trying to figure out which one is the human and which the computer. If you cannot tell, then the computer must be conscious. One objection might be that it puts too much challenge on the machine. It’s not as if a man could successfully imitate a computer! When a car has “wash me” drawn on the back, who is this “me”? Is the car truly speaking? Is it the writer? Is it the phrase itself? The dust? Most problems exist in a “problem space” and being able to step back and consider the space that you’ve put the problem in is a core function of intelligence. If your dog keeps barking at the fence, never considering running away from the bone a bit to get closer to it via a gate, he’ll never get it. He has to reconsider the problem space. Representation of knowledge is at the crux of AI. Knowledge doesn’t come in sentence like “packets,” it’s more abstract. This dialogue has the football game and the television that lets them view counterfactual situations. In everyday thought, we are imagining slightly different versions of situations that happened. Ones where we let some features stay the same and others “slip” to create a new reality. Symbols interact via fission and fusion. Fission is where they gradually separate into multiple new symbols. Fusion is where they come together to create larger meta symbols. Programs can pick up patterns in some areas, but not others, meanwhile humans will always pick up patterns that appear in their environment without explicitly looking for them. They just pop out at us. DH gives some speculations at the end of this chapter, including that a computer program will write beautiful music, emotions will not be explicitly coded into a machine, chess programs will not be exclusively chess players (and thus could refuse to play chess), and that AI programs may not become super intelligent. In this dialogue, the music and the piano are backwards, creating an odd feel to the sound. Where does your sense of having a will come from? You’ll probably say it comes from your brain, a piece of hardware you neither designed nor chose. You aren’t a “self-programmed object,” but you still do have a sense of desires and it springs from the physical substrate of your mentality. Do words and thoughts follow formal rules? Yes, if you go down to the lowest level, the hardware, to find the rules. Certain rule sets are inviolate, they cannot be changed. Author Z could have author E in a story, who has author T in a story, who has author Z in a story… but only if there is a fourth author, author H, who has them all in his own story! They are the strange loop, or tangled hierarchy, but H is outside of it. We feel self-programmed, but we have no access to our lower levels. Once you begin to question your own sanity, you can get caught in an ever tightening vortex of self-fulfilling prophecies. Death, personal non-existence, is incomprehensible. When you try to imagine your nonexistence you have to try to jump out of yourself. While you may imagine that you have jumped out of yourself, you really haven’t, it’s impossible, so most of us just sweep the whole mess under the rug. When you see the pipe painting in the pipe painting, you think that the pipe that’s a level “higher” is “more real,” but that’s absurd, they’re equally fake since they’re both in the painting you’re looking at. Yet we still feel drawn to the hierarchy of realness. Constant level crossing is what creates our sense of self, it will be necessary to be able to slip between multiple levels comfortably to understand the full richness of the mind-brain system. What makes us call a system a “choice maker” is whether we can identify with a high-level description of the process which takes place when the program runs. On a low (machine language) level, the program looks like any other program, on a high (chunked) level, qualities such as “will,” “intuition,” “creativity,” and “consciousness” can emerge. Self-reference and loopiness is likely at the core of understanding minds and developing AI. We, on the outside, can know that the print gallery image is incomplete in a way that the man in it can never know. We can step outside and see the hole in the system, which he can never observe. Bach’s endlessly rising canon gives the musical form of strange loopiness, continuing forever. The book ends on this dialogue involving six characters: Achilles, Tortoise, Crab, DH, Turing, and Babbage, and ends in the most appropriate way it possibly could.